Wilfred Bion’s insights into the analytic process have had a profound influence on how psychoanalysts and psychotherapists understand emotional change and pathological mental states. One of his most influential ideas concerns the notion that we need the minds of others to develop our own emotional and cognitive capacities. 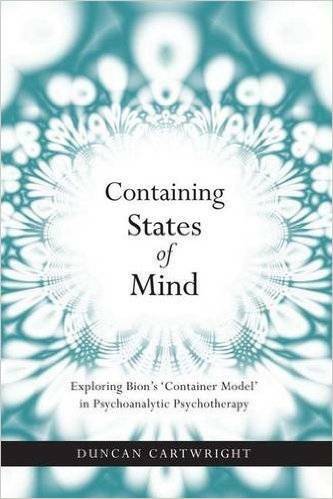 In Containing States of Mind Duncan Cartwright explores and develops some of the implications that Bion’s container model has on clinical practice. He argues that the analyst or therapist best fulfils a containing function by negotiating irreconcilable internal tensions between his role as ‘dream object’ and ‘proper object’. The container model is also used to illustrate different ‘modes of interaction’ in the analytic field, the nature of particular pathological states and some of the key dilemmas faced in attempting to make unbearable mental states more bearable. As well as addressing key theoretical problems, Containing States of Mind is a clinical text that renders complex ideas accessible and useful for psychotherapeutic and analytic practice and as such will be essential reading for all those involved in the fields of psychoanalysis and psychotherapy.